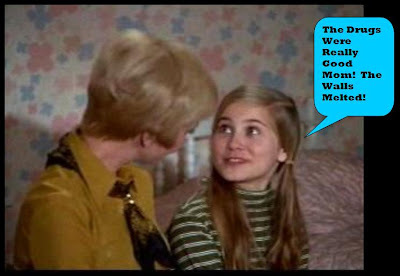 If it wasn’t the 1970’s Maureen McCormick, Marsha Brady, would have shaved off her hair and used an umbrella as a weapon too, but it was the 1970’s so she settled for a good old fashion eating disorder and cocaine habit. Maureen McCormick admits to People Magazine that she used to snort coke and she even suffered from bulimia. As the old saying goes, “what comes first the drugs or the bulimia?” Well, in Marsha’s case her bulimia came first once she turned 17 and had to go back to public high-school. It was her boyfriend (not Dougie Goodwin) who introduced her to cocaine. He was like, Marsha I want you to meet someone. This is cocaine. Cocaine, this is Marsha. The two quickly became friends and Marsha couldn’t get enough of her new friend. Maureen then realized that she had an addictive personality and after several relapses she claims that she has cleaned herself up through a combination of therapy and her faith. Somewhere right now, probably in a dumpster, Jan Brady is smiling.